This recipe was inspired by a cooking class by Psalm Lewis who goes by the name of Collard Gal. 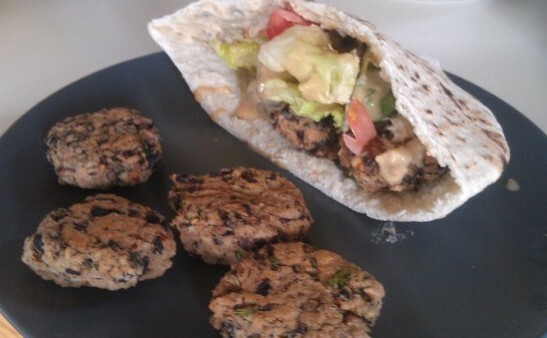 The class focused on Vegan proteins and included a recipe for a Black Bean burger that I used to create the small black bean and potato patties that you see in the pictures below. I wanted to try the recipe but I really didn't want a burger, so I hit on the idea of making pita sandwiches instead. Considering it all was a bit of a mad experiment it came out very well. And judging how quickly they disappeared, I wasn't the only one that enjoyed them. The original recipe called for combining all the ingredients in a food processor. I don't have one. So what was I going to use to mash up the black beans and yams? Turns out I had just the thing. Bake white yams (one medium, one small) in a 400 degree oven for 20 - 25 minutes. Open a can of cooked black beans (you want as little additives as possible), drain and pour into a large bowl. Rinse black beans thoroughly with water and drain again. Use the masher to mash beans until you see no whole beans left. Trim leaves from fresh cilantro until you have 1/4 cup of cilantro leaves. Slice leaves roughly and add to beans. When yams are done remove from oven and let cool 5 - 10 minutes. 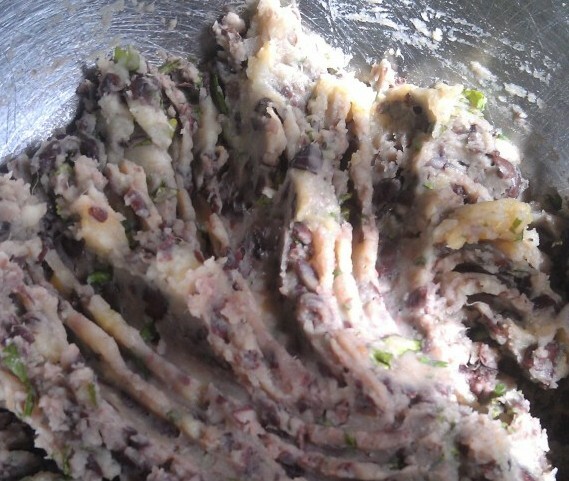 Peel skin from yams and mash with black beans. Mix yams and 2 tablespoons olive oil and 2 teaspoons of dijon mustard in with the beans and cilantro, use the masher so there are no lumps. Add a squeeze of lemon juice. 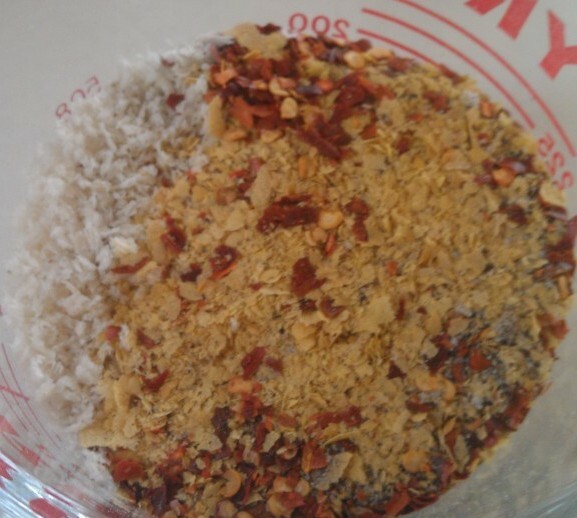 Next stir in the dry ingredients: 3/4 cup panko breadcrumbs, 1 tablespoon of nutritional yeast and 1/2 teaspoon of red pepper flakes. Also add salt and pepper to taste. 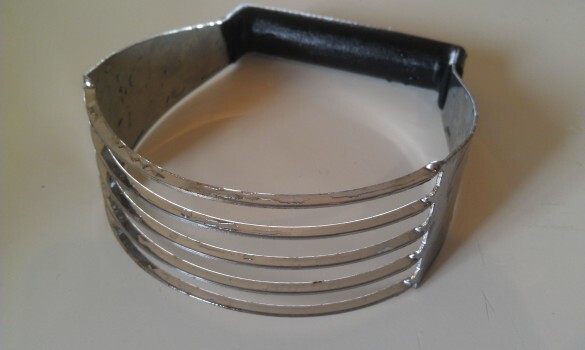 Form 1 inch balls (a large spoon helps) and place onto a baking sheet that is either covered with aluminum foil or parchment paper. Then gently mash the ball down into a pattie. Your thumb should do just fine. Bake for 15 - 20 minutes, flipping the patties over at the 10 minute mark. You want them to be lightly golden. So what goes well with baked black bean patties? 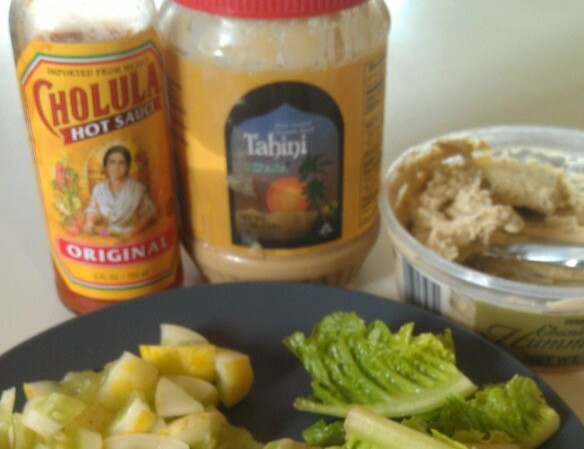 We pulled out a number of sauces and found that both hummus and tahini worked well. But it wasn't until we thought of adding Cholula as well that we reached black bean pita sandwich bliss. Here's the ingredient list for the black bean and potato balls. The original recipe called for parsley, if you use that, use a 1/2 cup rather than a 1/4 cup as cilantro is much stronger tasting than parsley. And of course feel free to skip the red pepper if you don't like spicy food.